Any list of Cape Town’s Big Five must-see sights must include Table Mountain. In fact, if you are in Cape Town you can’t avoid seeing Table Mountain, even if you don’t want to. It’s visible practically from everywhere in the city. It looms over the city as a gigantic omnipresence. It would have to top the list of must-sees in Cape Town. It dwarfs anything around, even other mountains. Cape Town’s high rise buildings are like ants at the foot of the colossus in comparative scale. But any respectable list of must-see or do events would have to include taking the cable car to the top of Table Mountain. Get a look at the world from that perspective, and a spectacular view of Cape Town, which hugs the lands at the feet of Table Mountain and its sister peaks, the Lion’s Head and Devil’s Peak. Also on the list of essentials when you are in Cape Town is a visit to Robben Island, where Nelson Mandela spent most of his 27 years in prison before emerging to be the leader of the country through its difficult transition to a democratic country. On Robben Island you are guided by a former prisoner of the institution, so you really get an insider’s view of a way of life no one would willingly be inside of, the horror of incarceration and hard labor experienced by Nelson Mandela and his peers at Robben Island. It makes his achievement as the leader of the building of a new nation based on reconciliation even more astonishing. Virtually everyone who visits Robben Island is thinking of one person: Nelson Mandela, but he was obviously one of many who suffered the fate of imprisonment, oppression or death at Robben Island. Two others who are worthy of remembrance were Massavana and Koesaaij, two Malagasy people who were leaders of a slave mutiny on board the ship Dutch ship Meermin in 1766. The men were imprisoned on Robben Island, died and were buried there. Both Robben Island and Table Mountain are World Heritage Sites and are said to be the only two World Heritage Sites that can be seen at the same time. The Victoria and Alfred Waterfront is also an irresistible attraction for visitors. It’s a perfect place for tourists to go and revel in its festive environment, its many shops and restaurants, the pleasure of the seashore and the boats that dock there. It has a spectacular ferris wheel that is a great landmark and presence even if you never consider riding it. Bo-Kaap is an area in Cape Town that is often photographed primarily for the brightly colored houses along Schotsche Kloof on the slopes of Signal Hill. Tour buses stop there on a constant basis and people get out to look at the houses, photograph them and explore the neighborhood and its shops and restaurants. 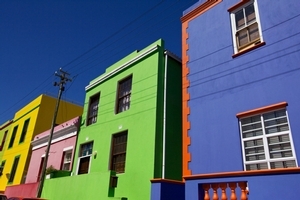 Bo-Kaap comes from the Dutch, meaning “above the cape,” and the neighborhood was formerly known as the Malay Quarter. The neighborhood is also noted for its curry. Most basic Cape Town itineraries include a trip to the Cape Wine District, such as Stellenbosch, Franschhoek and Constantia. These are a short drive away from the city, but worth the time. The mountain terrain is breathtakingly beautiful, and if you are interested in wine on any level, there are plenty of wine tastings to participate in at the various vineyards. That’s a respectable Big Five listing for Cape Town. Another standard inclusion in introductory itineraries is a tour of the Cape of Good Hope, a trip on which you see baboons and penguins and the lighthouse on that historical cape which was so called because it was where the Dutch sailors started to feel some hope that they were actually going to make it back to Europe after traveling around Africa to the Orient. But as truly great as those must-sees are, doing them all only scratches the surface of a real, well rounded experience of Cape Town. There are many great outdoor markets in Cape Town, one particularly good one is the Greenmarket Square on Burg Street between Longmarket and Shortmarket streets. 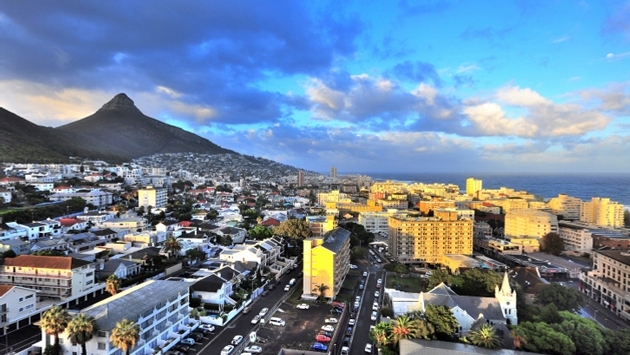 It’s one of Cape Town’s oldest gathering points, at the heart of the city and its history. It has been a slave market, a fruit market and in the 1950s was a parking lot. Today it is once again a thriving, lively marketplace and vendors set up there every day and then break down at the end of the day. The Slave Lodge, which is the building on Church Square where slaves were once lodged in Cape Town by the Dutch East India Company, the founder of Cape Town. It housed thousands of slaves during its time when slavery was a huge business there. Today it is one of South Africa’s Iziko Museums, a distinguished league of exhibition spaces that includes the incomparable Apartheid Museum in Johannesburg. One of my favorite places to roam around Cape Town is Long Street. A strip of several blocks in central Cape Town houses some of the most colorful bars, restaurants and shops that can be found anywhere. It is a joy to walk there and take it in. 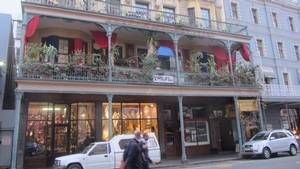 Many of the establishments are housed in buildings with wrought iron second floor balconies similar to those in New Orleans, and the similarity doesn’t stop there. Mama Africa’s is a restaurant with a super paint job where you might try some Mozambican peri-peri prawns or ostrich steak, and at night it turns into a music scene. Mesopotamia is a Kurdish kitchen at the corner of Long and Church streets. Madam Taitou, at 77 Long Street, is an amazing Ethiopian restaurant and craft shop full of flowering plants, wooden carved masks and statures, books and small cozy seats and tables to sit and enjoy the Ethiopian cuisine or a shot of Amarulla on ice. This place is enchanting and the food will make you feel strong like bull. Walking around Cape Town will provide endless fascination, wonder and pleasure. There is no end of things to see and enjoy. 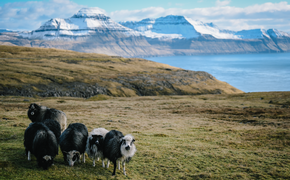 If you need help getting around and arranging your trip, Escape to the Cape is a good, solid destination management company that specializes in the Cape. It is so reliable South African Tourism relies on the company to take care of its guests when it is showing them around Cape Town.